In preparation, six Grandmothers gathered on October 4th for co-facilitator training at the retreat center. Kathie Murtey, Sue Gemoets, B. Campbell, Nancy Masland, Karen Eastburn, and Cathy Stafford came for a day to prepare themselves and create plans for the annual small “Circle” times. As the plans included one large circle for the opening and closing ceremonies, during other times, the Grandmothers would meet daily in small circles with co-facilitators, which would be these six Grandmothers. Their morning session began by forming their circle around a coffee table transformed into an altar of wisdom and love. They lit a candle and started with a reading and a few minutes of meditation. There was a “check-in” round to connect their hearts since last year’s Gathering. Of course, practical matters housekeeping items for the day needed to be shared. Then they were ready for the Morning Learning Circle. Kathie Murtey led by introducing The Circle Way Pocket Guide by Christina Baldwin and Ann Linnea. The discussion began with establishing the intention for this training day. As co-facilitators, the intention became to bond, learn, and support each other. As they came to the Circle Way Principles and Agreements, stories were shared, and examples were given of how these components of circle practice could be used in the upcoming circles. Personal experiences gave life to the discussion. Practical conversations brought to life the use of the talking piece, time-keeper and guardian as well as how to ignite powerful sharing within the small circles with open-ended questions. The stories from other Gatherings provided rich, fertile soil for new opportunities at this new Gathering. During this morning session the six grandmothers decided to meet each morning of the Gathering before small circles to clarify direction for the day and support each other with any concerns or desires from the Grandmothers. At 12:30 pm it was time to break for refreshment and time to re-energize for the afternoon session. The afternoon Learning Circle, led by Cathy Stafford, explored “Holy/Wholly Listening.” They began with reflecting on what represents their outer or onstage life and the inner life or backstage life. Parker Palmer’s book, A Hidden Wholeness: The Journey Toward an Undivided Life was the resource for the activity, “Life on the Mobius Strip.” Rich discussion and vulnerable sharing of what others may see and what lies deep within provided a look at their “true selves.” Then the group wondered about what each Grandmother would bring to the large and small circle groups. How would these co-facilitators hold holy, sacred space for listening to the whole of everyone? The training day concluded with a check-out round where each woman had a chance to share her reflections on the day. Each voice spoke of the value of preparing through reviewing, teaching, learning, guided experiences, bonding, and most importantly laughter… WHOOPEE! Time for dinner at 5:00 pm and each co-facilitator partnership agreed to plan for the first small circle gathering coming the next day. A review of the Grandmother Gathering feedback forms showed that many attendees particularly enjoyed their time in small circles. Many complimented the co-facilitators on their knowledge of the Circle Way practices and principles, on their ability to hold the container together in sacred space and to invite each Grandmother to be comfortable speaking her voice during small circle discussions. 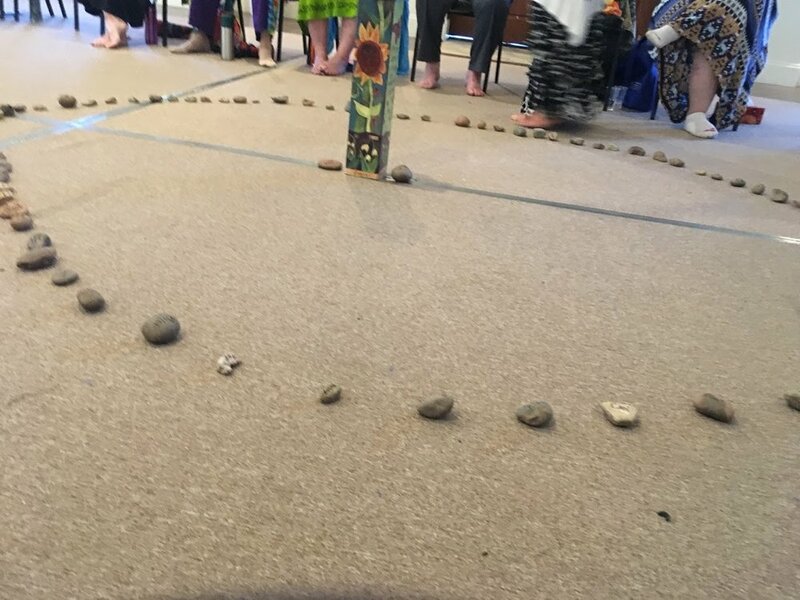 Most of Grandmothers asked that the 2018 Gathering include additional time for these small circles. Some even suggested giving up personal time as they would rather be in their small circle, sharing with each other. Each of the six grandmother-facilitators was very appreciative of the grant from The Circle Way. The financial help off-set the cost for the facilitators to share a day together in deep reflection and preparation, in service of the annual Gathering. Abundant thanks to The Circle Way board for making this day of review, learning and bonding an enjoyable time. WHOOPEE!! Cathy Stafford, Ed.D spent over 35 years in the education profession as a teacher, reading specialist, university professor, and public school administrator. In 2012, after serving in Avondale Elementary School District for 20 years, she retired as their Superintendent. She is a 2013 Graduate of Tacheria Interfaith School of Spiritual Direction where the Spirit stirred the creative longings of re-membering being a teacher. With the blessing of the Tacheria Interfaith Spirituality Center Board in 2014, Cathy became the Director of Wisdom’s Way School in Phoenix as a “sister” spiritual direction school. The Circle Way is one of the resources for the Wisdom’s Way School 2-year program. Cathy has been a participating in the Arizona Grandmothers Gathering for several years including the privilege of being a small circle co-facilitator for 2 years. Cathy’s passions include her holy grandboys who are her best teachers (Cole and Zane), wisdom seeking, spiritual companioning, and being open to the Divine in her journey of growing and learning. Kathie Murtey is a Grandmother who has led and participated in women's circles since 1970. She participated in a weekly circle in her church for twenty-five years and called two women’s circles in her home, each lasting for over two decades. She came to The Arizona Council of Grandmothers in 1995 shortly after attending the 4th United Nations Conference on Women in Beijing, China, and annually attends the Council’s Gathering. Kathie identifies as a global citizen, a facilitator/storyteller, a peace maker and an environmentalist. She is committed to doing all she can to bring forth a world where women are equally valued decision makers in partnership with men. She has recently relocated to Illinois and lives with her sister.